Without taking your practice exam I would not have been adequately prepared and would not have passed. Thanks to you I scored a 85% my first time! Our practice test is a teaching tool for those preparing to take the National Registry Certification Test. It is a collection of 200+ of the hardest, most difficult questions we at TeamCME could come up with that touch upon all identified aspects of accredited training programs and the latest versions of the National Registry Certification Test. As you answer each question, a comment appears with the reason that each answer is correct. This reinforces a deeper knowledge of the material. 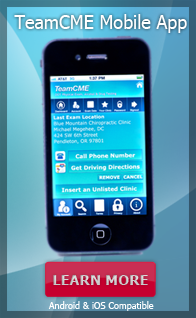 The TeamCME practice test is dynamic! New questions are added periodically and appear as additional numbered questions at the end of the list. Also included are suggestions for “correct thinking”, what to look for in test questions, the system used to take the test, and test taking skills to employ. This product will give you an access code for the TeamCME practice test, good for 1 month from the date of purchase. Information on the Practice Test is also available under "Training" in the Navigation Bar near the top of the "Home" page. Never Forget to Renew Your Certificate with Expiration Alerts! To view the flight physical form and print out a copy to take your examination, use the link below. To View the Merchant Mariners Physical Form and print out a copy to take to your examination, use the link below.